Enjoy coveted Congress Ave and Lady Bird Lake views from The Austonian&apos;s 15th floor "F" residence located on the Southeast corner. Custom finishes include an entertainer&apos;s bar with Sub-zero wine fridge, onyx counters, incredible furnishings (see agent for what conveys) and A/V system throughout. Two generous bedrooms with private en-suite baths, and motorized shades throughout. Includes 2 parking spaces. 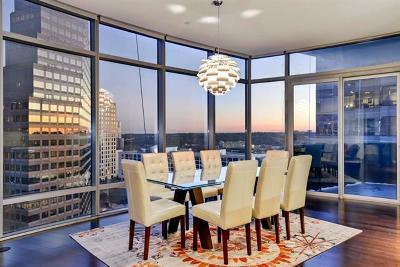 The Austonian offers world-class services with 24-hr concierge and spacious amenities.